Professionally guided hunts with our dogs (yours are welcome). Three pheasant daily limit (option to increase the bird limit). Cleaning and packaging of your game. Lodging in the beautiful Orchard Lodge and all it's amenities. All full course, home-cooked meals. We encourage our groups to arrive early in order to settle in, acquaint themselves with The Orchard Lodge, and not rush the start of a wonderful experience. A group size of thirteen or more is required to reserve the entire Lodge. A $500 nonrefundable deposit per hunter to hold your calendar dates. A $100 per day discount to groups of thirteen or more. 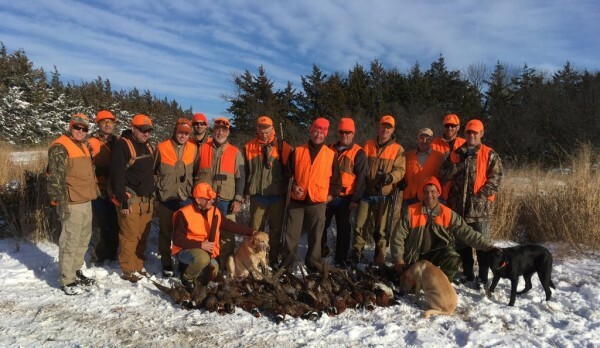 South Dakota public pheasant hunting always starts the third Saturday in October and continues through the end of the year. The daily bag-limit is three roosters, with a possession limit of fifteen. We also hunt our preserve-land that is licensed by the South Dakota Game Fish and Parks Commission. This license allows us to hunt from September 1 to March 31 in those designated areas. Because of our location in south central South Dakota even the preserve shooting areas for pheasants are predominantly native birds. The preserve areas allow us to, not only, extend our hunting season, but to increase our hunter’s daily limit.